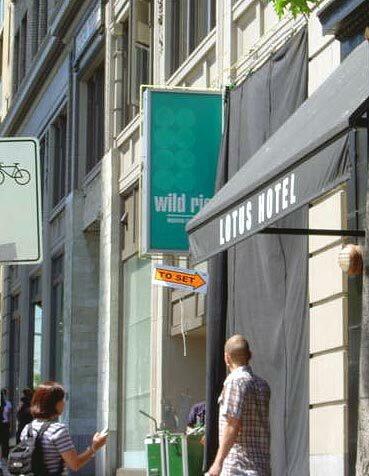 Keep up to date with the goings-on in the L word neighbourhood with our roving reporters reporting back to us from on location in Vancouver. If something is going down in the Couver....we'll hopefully have it here. These are photos of Jennifer Beals shooting scenes in NY. The L Word filmed at 1251 Howe St at the Odyssey night club from 7am to 6pm. Donald spotted them filming at the Sutton Place Hotel and was kind enough to send us some photos. ...and decided to drive by The Planet. 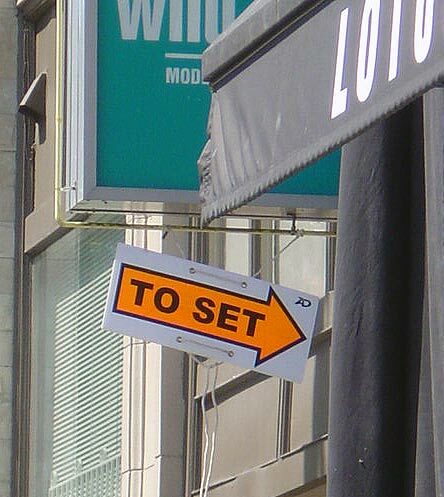 Much to our delight and surprise, TLW was setting up for filming then! There were tons of crew and extras around, and it looked like there was a big party at The Planet. There were strobe lights all around. After hanging out for about 40 minutes, we spotted Jennifer Beals and Mia Kirshner. We learned that they were planning on filming for 4 hours at that location to net roughly 3 minutes of screen time. Also, we learned that they had been filming down the street all day. Those people work incredibly long hours, and we gained a new appreciation for how much effort goes into this amazing show. We happened to meet the owner of The Iron Works, who said that TLW filmed at his place about 9 times so far. I can't tell you all what a thrill it was to see Bette and Jenny in action. They were standing and talking outside The Planet. Bette was smoking a cigarette, which surprised us. We didn't remember her smoking in Season 1. Anyway, they both looked wonderful, especially JB. I was standing about 40 feet from them. I was too far from them to get a good picture, but I did get to see JB's winning smile a few times. We found it interesting that Jenny and Bette were alone in a scene outside of dance party at night. "They've also dressed up the outdoor seats with plants and umbrellas (shade variety) and have Americanized the street with U.S. mailbox and USA Today newspaper box props." Apparently they've been there for a few days now. 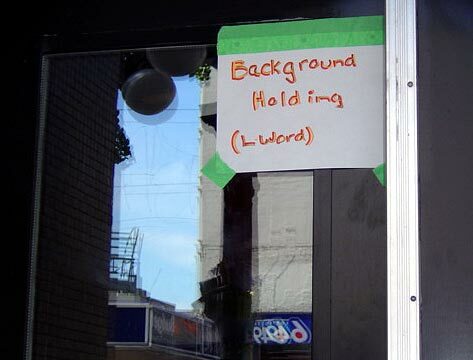 Today I heard that the L Word was filming here in Vancouver. I walked over to the site with a friend and at the moment it was Dana & Alice having coffee in a coffee shop. We hung around for awhile and spoke to nice location manager who basically let us in the view of the camera. They were filming a scene at a garage. It looked like Luvia Peterson (who made an a appearance in season 1 as 'the Cowboy' in a drag king show) was playing the role of car mechanic. A few butchy looking women were nearby as extras. I got a shot that afternoon on my way home. They weren't filming anymore but still had all the props up. That evening they filmed at the Lotus Club. A friend of mine was an extra and she said Kate was the only one on set.